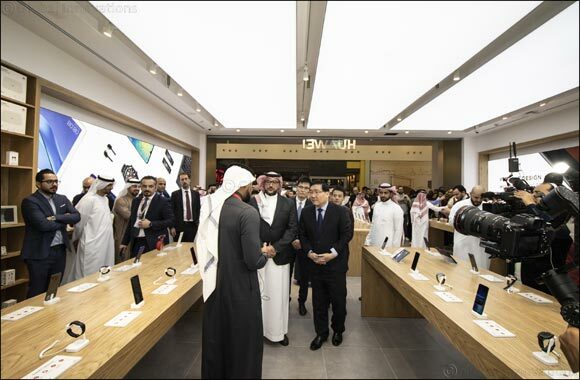 Riyadh, January 6, 2019: Huawei Tech Investment Saudi Arabia announced the inauguration of its first ever store in the Kingdom which opened at Riyadh Park Mall in the capital city Riyadh, and is the largest store in the Middle East and Africa region. The official opening was attended by His Excellency Deputy Governor of investments for the Saudi Arabian General Investment Authority Mr. Sultan Mufti, His Excellency Mr. Li Huaxin, Chinese Ambassador to Saudi Arabia, and C-level Executives from Huawei and members of the media. And for Huawei's belief in the importance of developing and training Saudi cadres and creating job opportunities for them, Huawei's new retail system will create around 100 job opportunities and training for Saudis over the next five years. It will also hold training courses in multiple technology areas that will benefit more than 360 people a year. At the same time, it will invest over 6 million USD in the new retail system in Saudi Arabia over the next five years and will collaborate with its partners in the Kingdom to enhance the experience associated with retail sales in the Saudi market, ensuring joint success for Huawei and its partners in Saudi Arabia. The Kingdom is currently undergoing a rapid digital transformation striving to achieve the goals set by Vision 2030 and the National transformation 2020 plan which are expected to provide ample opportunities across various sectors, that in turn will benefit from the markets technological advancements in order to create efficient, state-of-the-art services. This places HUAWEI as the ideal partner to push the wheel of transformation into the digital age as it operates three main groups within the HUAWEI umbrella: The HUAWEI Carrier Network Business Group, HUAWEI Enterprise Business Group, and the HUAWEI Consumer Business Group. This means HUAWEI is fully involved in all technologies, products, solutions and services that are needed by various sectors to develop their industry.